Discussion in 'Scripting' started by Mr.X, Apr 27, 2016. 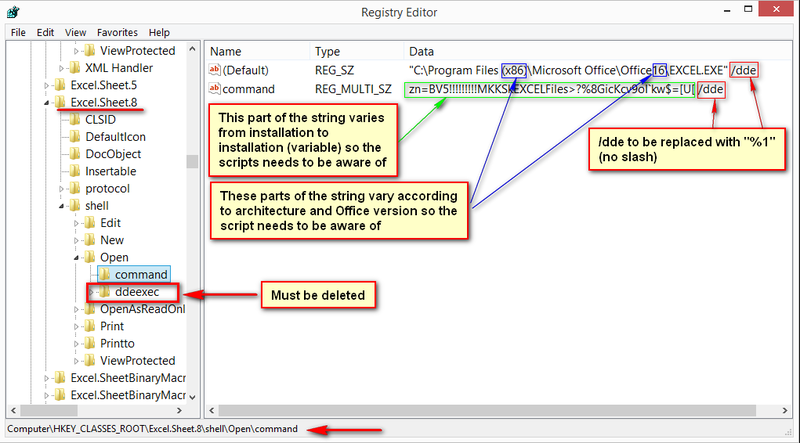 I need a change script to change some registry entries for M$ Excel program (solely 2010, 2013 and 2016), to make it work along with Sandboxie. I can't do a fixed reg file since it has some variables that changes and become unique on every installation on every different scenario. The image shows only Excel.Sheet.8 entry yet the script must consider Excel.Sheet.12 and Excel.SheetMacroEnabled.12 as well. @=""C:\\Program Files (x86)\\Microsoft Office\\Office16\\EXCEL.EXE" /dde"
@=""C:\\Program Files (x86)\\Microsoft Office\\Office16\\EXCEL.EXE" \"%1""
However, on VMs I watch those hex numbers in blue to vary from installation to installation. You need it for commercial or privat use? For private use. Personal computers of my brother, son, wife and mine use Sandboxie and different Office versions. I can do it but it will cost me ca. half to an hour. Maybe I find time the next days. - but no promise or commitment.